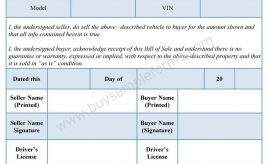 A bill of sale deposit form is a document that contains detailed information of a certain bill that is issued on sale of any product or service and deposited at the appropriate office for record keeping or analysis. If the sale does not go through the seller may feel entitled to keep the deposit for example to offset against having to advertise the goods again. 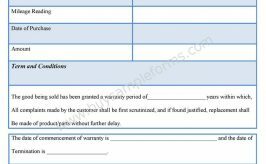 That is why a bill of sale deposit form is used. 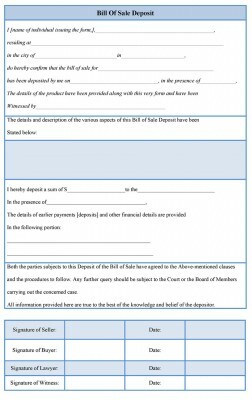 Such a form contains all necessary details such as name of the depositor and amount deposited, nature of transaction or sale for which the deposit form is being issued, name of second party, terms and conditions etc. 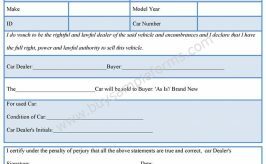 Below is a sample Bill of Sale deposit form. 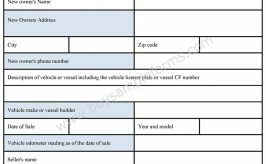 Download online a Bill of Sale deposit template either in MS Word or editable PDF format.